I think these picture show the start of something big. Canadians Colin and Julie Angus are amphibious explorers, rowing and cycling. 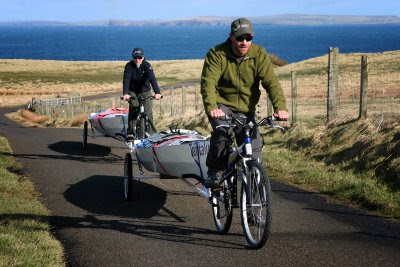 Here they are towing their boats up a hill in Scotland, and rowing them across the English Channel with the bikes and trailers stowed inside. 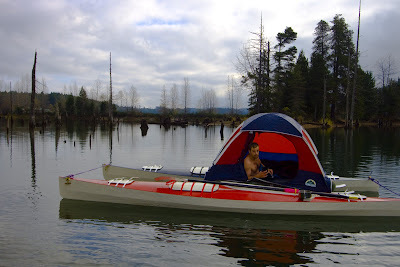 And below you can see them camping in comfort, the boats rafted together with a tent on the top. 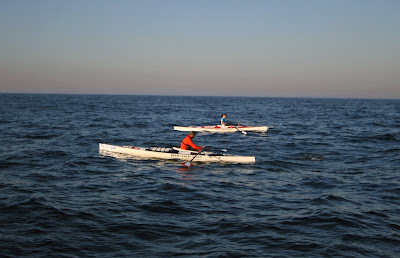 Last year Colin and Julie rowed and cycled from Scotland, where his family comes from, to Syria, where Julie's family roots are. The trip took in the Rhine, the Danube, the Black Sea and the Med. You couldn't imagine a better demonstration of the effectiveness of the row/bike combo. There is a great log of the trip here. So it is great news that Angus Rowboats are making and selling the boats from next Autumn. The 18ft Expedition model, as taken on the trip, will cost about $1,500 in kit form, ready to build using stitch and glue techniques, plus $1,890 for the sliding seat and rigger parts. There will be a 15ft version suitable for sheltered waters but still capacious enough to carry a bike. I imagine city folk buying them to hang in the hallway and tow to the river by bike for weekend or evening rows. For us on this side of the pond, adding shipping and VAT to the cost would probably be prohibitive, but considerately plans are being offered at the modest price of $120. Great post Chris. Terrific concept. With plans available and such a low £ to $, plus 20% import taxes it would be much better to set up a UK kit cutter, either Alec or a supplier I know who can include finger joints for the ply lengths and a tab through slot assembly to make it very quick to build. Did you get my e-mail inviting you over to try the Echo? What a great post and an admirable couple. I guess you know my views on boatbuilding, should be relatively easy to build a light weight rowing skiff for under £500 if you keep it simple.